My life as a communist actually began without me knowing it, on Friday evening, when Glenn Beck spent his program explaining about a “communistic” conspiracy that included 10 groups in America. One was 350.org, a global campaign to fight climate change that I helped found three years ago. He even put our logo up on his whiteboard – and next to it a hammer and sickle. Since I don’t actually watch Mr. Beck, I didn’t know about it until e–mails began to arrive, informing me that indeed I was a communist. My first reaction was: I’m not a communist. I’m a Methodist. But then I reconsidered. What exactly was I doing when those e–mails arrived? I was downloading an iPad app, At Bat 11, which lets me (for only $14.99) hear the broadcast of any baseball game anywhere in the country. Since I live in New England, I use it to track our beloved Boston squad, whose moniker I had never before deeply contemplated. Now – well, enough said. And the next morning, on my first full day as a communist? I spent most of it outdoors, at the annual New England festival for young cross–country ski racers. More than 500 kids from across the region were competing, and I was standing on the toughest hill cheering. And here’s the thing – at least with the first– and second–graders, I was cheering for everyone equally. Not only that, but did you know where this particular type of skiing was invented? Norway. Some people laugh at Mr. Beck – earlier in the same week, for instance, he’d ventured the opinion that “Reformed Judaism” was pretty much the same as Islamic extremism. Not 100 percent correct, but the next day he apologized, and explained the research technique that had led to the slight miss: “I had, was having a conversation with a few friends the night before – one of them, I trust on things like this, and I’m not even sure if I misunderstood him, or misheard him, or what.” In my case, though, the evidence seemed fairly damning. To me that sounds absurd. Instead of the 16 companies that provided more than half the chamber’s budget adapting their business models to a world of safe renewable energy, they wished all people everywhere and forever to change their physiologies. But now I see that my protests can be read as a gesture of support for human solidarity, with all that implies. I should have known better than to go after the U.S. Chamber of Commerce. After all, Mr. Beck just last year held a telethon on its behalf, encouraging listeners to send the chamber checks, and ponying up $10,000 of his own $32 million in earnings. “They are us,” he’d explained – and indeed, an executive of the chamber called in to thank him. The Chamber of Commerce spends more money than anyone else lobbying Congress. They dropped hundreds of thousands on the last state elections in Wisconsin, all of it for the side now standing up for union–busting, I mean human freedom. Opposing them – well, clearly I’m hammer–and–sickle all the way. 350.org 10–10–10 Global Work Party, Minneapolis, Minnesota, USA, 2010. Photo courtesy 350.org. I turned 50 last fall – that’s half a century not understanding who I really was. There’s something liberating about finding out. After all, it was Marx who said that above 350 parts per million carbon dioxide in the atmosphere, we can’t have a planet “similar to that on which civilization developed and to which life on Earth is adapted.” No, wait, those were NASA scientists. The same people who faked the moon landing. This is a complicated world; I’m going back to the baseball game. This story first appeared in The Washington Post and is reprinted here with Bill’s kind permission. 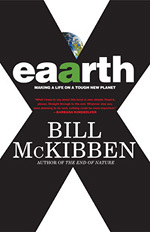 Bill McKibben is an American environmentalist and writer who frequently writes about global warming and alternative energy and advocates for more localized economies. In 2010 the Boston Globe called him “probably the nation’s leading environmentalist” and Time magazine described him as “the world’s best green journalist.” He is author of many books, including The End of Nature, Deep Economy: The Wealth of Communities and the Durable Future, and most recently Eaarth: Making a Life on a Tough New Planet. McKibben is Schumann Distinguished Scholar in environmental studies at Middlebury College and a co-founder of 350.org.